The BE$T program works with entrepreneurs who are ready to start a new business or improve an existing one. Our program is open to all who are interested (regardless of employment or income levels) and it is also an approved Self-Employment Assistance Program (SEAP). 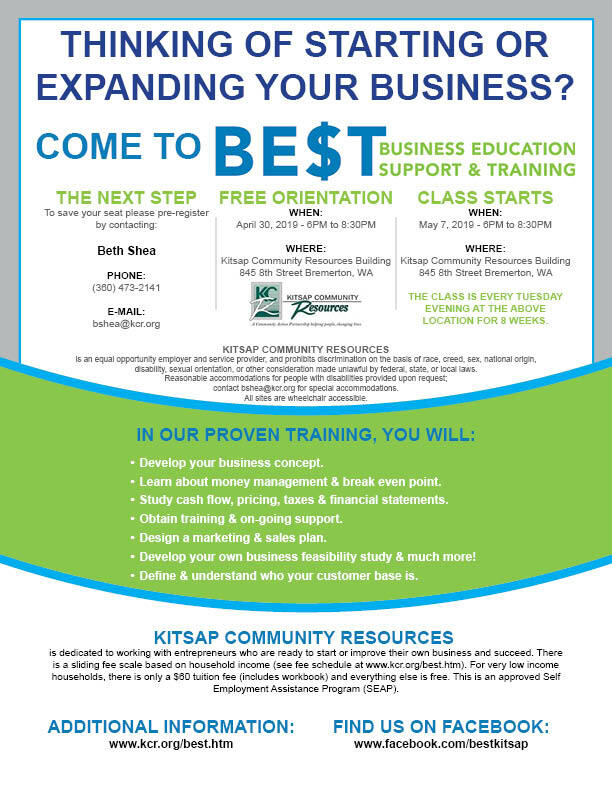 Kitsap Community Resources Business Education Support & Training (BE$T) Program is committed to providing the business training and network of supportive community services and volunteer business professionals to enterprising individuals, including those with limited financial resources, to gain self-sufficiency through small business ownership. Next scheduled class listed here. The program has operated in Kitsap County since 2000, and over 1300 aspiring entrepreneurs have completed the course. In a typical year, BE$T helps over 30 new businesses launch in Kitsap County. In 2017, BE$T businesses hired over 60 employees contributing economic growth and stability to our community. The only program of its kind in the Olympic Peninsula, the KCR Business Education Support and Training (BE$T) program prepares graduates for starting and/or managing a successful Kitsap County business.